This is my final post in this series about Select Queries. In Select Queries Part 1: Simple Queries, I discussed the SELECT and FROM clauses. In Select Queries Part 2: Restricting Rows - the Where Clause, I talked about the WHERE clause. Select Queries Part 3: Sorting and Grouping (ORDER BY, GROUP BY) showed the Order By and Group By clauses. This time I'm going to discuss a few lesser known but powerful clauses: Top, Distinct, Transform...Pivot, and Parameters. Another less well known section of a SQL statement is the Predicate. The Predicate follows the SELECT keyword and precedes the Field List. There are two important predicates: TOP and DISCTINCT. The Top Predicate allows you to display the top(x) values from a query in terms of either a number or percentage. I can't really talk about the TOP predicate without discussing the ORDER BY clause because the rows displayed are determined by the ORDER BY clause. This will display ten rows of ProductNames whose costs are the LOWEST. This will display 25% of the total number of rows of the Product table whose costs are HIGHEST. In other words, the query creates a standard Select Query, applies the sort order in the ORDER BY clause, then displays just the top X values from the query. Returning Random X records from your table. User input TOP value (parameter). The DISTINCTROW predicate is unique to Access. It will return unique records across the entire record, not just the fields in the Field List. Honestly, though, I've never found a good use for DISTINCTROW because I always have a Primary Key in all my tables, so all of the rows are already unique. To create either the DISTINCT predicate in the Query Builder, set the Unique Values property to Yes, to create the DISTINCTROW predicate set the Unique Rows value to Yes. 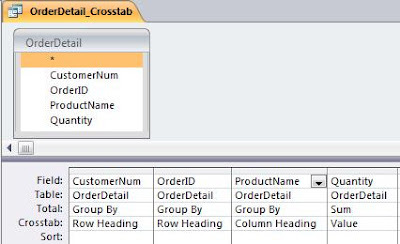 The easiest way to learn Crosstab Queries is to use the Crosstab Wizard that's available when you create a New Query. When the user inputs a valid customer number, the query returns the row(s) applicable to the customer entered. A parameter can also reference a control on a form. Suppose I have a Customer form and I want to see all of the orders associated with a particular customer. I could have a query that looks at the CustomerNum in the current form and return all of the order numbers for that customer. It would look at the value in the CustomerNum text box on the frmCustomer form and use that as the parameter value to return all the orders for customer 100. Access does a pretty good job of figuring out what the data type of a parameter is. However, there are times when it gets confused. This is particularly true when trying to use parameters with a Crosstab query. 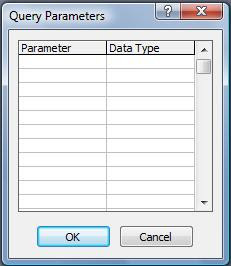 In these cases, you can define what the data type of the parameter will be with the PARAMETERS Clause. In my last post, Select Queries Part 1: Simple Queries, I talked about the first two sections of a Select Query, the SELECT clause and the FROM clause. These allow you to display certain columns from designated tables. The next section is one of the most powerful features of a query: the WHERE clause. The field is a column in the base table(s) or a calculated column. It does not have to be in the Field List. The comparison operators are the standard math comparators: =, <, >, <=, >=, or <>; with some SQL specific ones added: IN/EXISTS, BETWEEN, LIKE, and IS NULL. The value portion can be either a hard coded value (like "hammer" or 25), or it can be another field or expression. IN allows you to test if a field matches one of a list of values. IN can also contain another SQL statement. The SQL statement contained in the IN must have only one field in the Field List. I'll talk more about this in a later post when I discuss subqueries. IS NULL is a special comparator that tests whether or not a field is Null. The other comparison operators do not work with Null, so IS NULL is the only way to test for it. 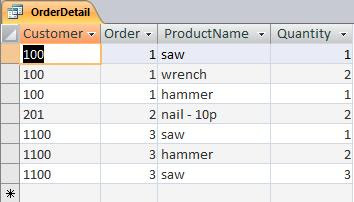 WHERE ProductName="10p nail" OR ProductName="8p nail"
You have to be careful when creating multiple criteria in the Query Builder because sometimes they don't say exactly what you think they do. It matters which lines in the Criteria that you put your expressions. You create ORs on separate lines, while you create ANDs on the same line. It gets even more complicated with multiple ANDs and Ors. For instance, what does this statement mean? You might think it means I want "saws and hammers with a cost between 5 and 10". However, it doesn't. There is an Order of Precedence to the logical operators as there are with arithmetic symbols. AND always takes precedence over OR. So what will really be returned is "ALL saws and only those hammers that cost between 5 and 10". The AND expression will be evaluated before the OR expression. Because of the possibility of error when creating complex WHERE clauses in the Query Builder, I usually create them in the SQL View where I know I can control the parentheses. There is one more important Logical Operator, and that's the NOT operator. The NOT operator reverses an expression. It can be used with the LIKE, IN, and BETWEEN operators or entire multiple-expression WHERE clauses. It returns all rows EXCEPT those that would have been returned if you hadn't used the NOT. WHERE ProductName NOT LIKE "ham*"
Next time, I'll look at sorting and groupin in: Select Queries Part 3: Sorting and Grouping (ORDER BY, GROUP BY). The most common type of query is the Select Query. Its purpose is to return a dataset that is a dynamic view into your database. In fact, in other SQL dialects, like T-SQL (SQL Server) or SQL*Plus (Oracle) a saved Select Query is called a View. The Select Query is very flexible and allows you to see your data in a variety of ways. You can specify which columns you want to see. You can also restrict the rows returned based on one or more criteria. You can join multiple tables together on a common field(s). You can return unique records, the top or bottom number (or percentage), sort your data on one or more columns. And you can make your query interactive by adding parameters. 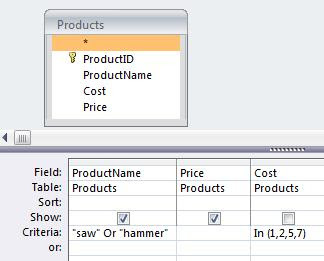 A Select Query can be created in the Query Builder view or directly in the SQL view. go to the Create Tab on the Ribbon and select Query Design. The Query Designer (aka QBE) looks like Figure 1. The top pane shows which table or tables on which the query is based. The bottom pane shows which fields will be used in the query and the criteria used to restrict the rows. It is fairly easy to learn SQL by creating a query in the Query Builder and switching to SQL View. You have to give the calculated column a name also called an 'alias', which I decided to call "Margin". In the Query Builder, it goes in front of the calculation. In SQL View, it follows the calculation with the AS keyword. The square brackets () are not strictly necessary here, but there are times that they are. For instance, if you had a space in your field name (Product Name), you would be required to put square brackets around it ([Product Name]). The asterisk is not the most efficient way of specifying columns, especially in a large table with many columns. If performance is an issue, you might want to restrict your query to just the columns you need. On the other hand, if your base table structure changes frequently, the asterisk can be useful because you don't have to change your query when you add or remove a column. The From Clause specifies the table or tables that form the basis of the query. Ultimately, of course, all the data comes tables, but you are not limited to specifying table names. You can also specify saved queries just as if they were tables. This is useful for creating "stacked" queries, that is, queries that build upon a previous query or queries. 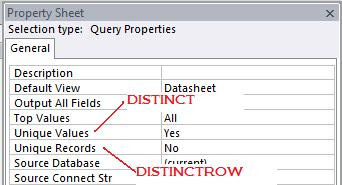 In the Query Builder, the From clause is represented by "tables" in the upper pane (see Figure 1). To add another table or query, right-click in the upper pane and select Add Table in the pop-up box. Another very important function of the From clause is to create Joins, that is, merge the records of two or more tables on common fields. For instance, if I wanted to see all of my Orders and their corresponding Order Details, I can join the Order table and the Order Details table. Figure 3 shows the Query Builder View. In this case, the fully qualified field name (that is with the table name in front of the field name) is required because the OrderID field exists in both tables. There's a lot more to be said about Joins, and I'll do that in a later post. This example is not particularly useful, but it does demonstrate how a SQL Statement can be used as a result set in the From clause. You have to be careful, however, because Access doesn't always handle this well. I'll also talk about that in a later post. A query is a multi-purpose object in Microsoft Access. It can be used to display data from a single table or multiple tables, perform calculations on your data, modify data within your tables, and create or modify the structure of tables, indexes or relationships. Basically, anything that uses Structured Query Language (SQL) is called a query. It is important to realize that queries are dynamic, that is, they allow you to view or manipulate data stored in your tables. I had one customer who complained that she was losing data from her database. Turned out she was creating queries and then deleting rows from the query that she didn't want to see. She didn't realize that in doing so, she was actually deleting the rows from the table the query was based on. Access has two ways to create or modify a query. The Query Builder View allows you to create queries in a graphical interface. SQL View allows you to create queries directly in the SQL language. The two views are interactive. In other words, a query created in the Query Builder will be viewable and editable in the SQL View and vice versa. A good way to learn SQL is to create one in the Query Builder and view it in the SQL View. There are times when you want to aggregate your data, that is, you want to group your data and apply some mathematical function each group. The most common functions are sum and average. Access provides a type of query called a Totals Query that will do this. A Crosstab Query is a special kind of aggregate query, which calculates an aggregate function (like sum or average), and groups the resulting dataset by two sets of values — one down the side and another across the top. Crosstab queries are particularly useful for displaying summarized data in an easy to understand format. Action Queries (also called Data Manipulation Language Queries or DML) make changes to the data in your tables. You can delete all or some records from your table (see Action Queries: Delete Query). You can change the value of a field or fields in all or some records in your table (see Action Queries: Update Query). You can append records to a table, either selecting records from another table or append specific values (see Action Queries: Append Query). Lastly, you can create a new table from selected record from an existing table (see Action Queries: Make-Table Query). 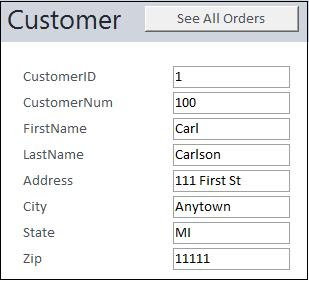 The only thing SQL Specific queries have in common is that they cannot be represented in the Query Builder window, so once created, you can never go back to the Query Builder window. DDL queries (also called Data Definition Language queries) allow you to create new tables and indexes modify existing ones. A pass-through query is used to return records or manipulate data in a server-based database like SQL Server or Oracle. It simply passes the query on to the host database engine, bypassing the Jet database engine altogether. A pass-through query must be written in the SQL dialect of the host engine. For SQL Server, that would be T-SQL. For Oracle, it would be SQL *Plus. A query can be updateable or non-updateable, depending on a lot of conditions. 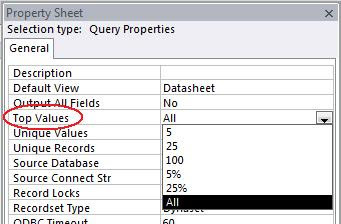 If a Select Query is updateable, you can actually add, delete and modify records in the base table through the query. In Access, the * button on the Navigation Bar will be visible if the query is updateable. It will be grayed out if it is not. The actual conditions under which a query is updateable can be found in the Access Help System. Action queries can also be updateable or not depending on the same conditions as the Select query. This is based on whether the dataset returned in the FROM clause of the action query is updateable. Some queries are inherently non-updateable. These include Union queries, Crosstab queries, and Totals queries. Non-updateable queries can only be used to display data. For more detailed information see "This Recordset Is Not Updateable. Why?" Some SQL dialects, like T-SQL, allow you to use procedural constructs like IF statements and Loops, in a query. Access SQL does not. However, Access allows you to create and execute queries in Visual Basic procedures through the use of DAO (Data Access Objects), which is a library of objects that allows you to programmatically manipulate the database. If I have a small company, any individual employee can be distinguished by a combination of First Name, Middle Initial, and Last Name. This combination uniquely identifies each employee. If I have a larger company, the chances increase that I could have two employees that have the same name. So the name can no longer be used to uniquely identify a record. So instead, I could use a number like Social Security Number. A primary key is a special kind of index (see What is an Index?) that is composed of a field (SSN) or combination of fields (First/Middle/Lastname), which uniquely identify a record. A primary key has a number of useful properties. First, the value in the primary key cannot be duplicated. If it is a single field, that value cannot be repeated. If it is composed of multiple fields, that combination of values cannot be duplicated. So in the samples above, having a primary key would mean that I could not put two "Roger J Carlson"s in my database. Secondly, the primary key cannot be NULL and no portion of the primary key (in the case of a multiple field key) can be NULL. (See What does NULL mean?). The NULL means the value of the field is unknown. Obviously, if we don't know the value of the fields, we can't guarantee the value is unique. So disallowing NULLS guarantees we have a valid value in the key fields. Thirdly, in order to create relationships, there must be a unique index on the field. Since by definition, a primary key is a unique index, a primary key makes an ideal join field. I will discuss this in a later post. There are two basic types of primary keys: Natural Keys and Surrogate Keys. A natural key is one composed of a field or fields that already exist in the table. In my examples above, both Social Security Number and Firstname/Middle/Lastname are natural keys. Natural keys can be composed of a single field or multiple fields. It is important to note that a table can only have a *single* primary key. It is incorrect to say that a table has multiple primary keys. In the case of a multi-field primary key, it has a single primary key composed of multiple fields. A surrogate key is an artificially created number. It has no real-world meaning, and is used mostly in relationships with other tables. In Access, you use the Autonumber datatype to create a surrogate key. This number is system-created and is guaranteed to be unique. The disadvantage of a surrogate key is that it does not have real-world uniqueness. It would be possible to enter two records for Roger J Carlson, each with a different system-created number. To protect against that, you should also create a unique index on those fields that would otherwise create a natural key. The advantage of a surrogate key is that it will never be affected by real-world changes to the database. It is also much more efficient to join tables on a single number than on multiple text fields. Opinions differ, but I prefer a surrogate primary key with a separate unique index. This separates the functions of the primary key: the surrogate key for relationships and the unique index to control real-world uniqueness. In this way, if the conditions that effect the real-world uniqueness (as in the case of moving from a small business to a large business mentioned above), the table relationships will not be disturbed. Creating a primary key in the Access User Interface is easy. Just open the table in Design View. For a surrogate or single field primary key, select a single record and click the Primary Key button. For a multi-field primary key, just hold the Control [Crtl] key as you select the fields and then click the primary key button. The purpose of a primary key is to create a unique record. But uniqueness from a database engine perspective is not necessarily the same as uniqueness from a real-world perspecive. Natural keys perform both these functions. However, surrogate keys only perform one of them, i.e. identifying records for the database engine to join. It does not, however, help the database user very much to identify unique entities. For instance, suppose I a customer (Roger J Carlson) to a customer table and the surogate key gets assigned a value of 233. Now, another data entry person also enters the same customer. This copy of Roger J Carlson is assigned a value of 245. Both Roger J Carlson's refer to the same real-world customer. Which one is right? Impossible to know. So, while the record is unique from the database engine perspective, it's not from a real-world perspective. To guard against that, when you use a surrogate key, you also need to create a unique index on a field or combination of fields that will uniquely identify the real-world Roger J Carlson. Once Roger J Carlson has been entered, it will there after be impossible to enter another Roger J Carlson. Obviously, in a large database, such a unique key wouldn't work. However, I could use Name, Gender, Birthdate (or some other unique combination of real-world attributes). What does NULL mean? How is it different than the Empty String? One database concept given to much misunderstanding is the NULL value. What is it? Null means that the value is unknown. This is different from the Empty String. The Empty String ("") means we know what the value is, and the value is, well, empty. That is, we know that there ISN'T a value. Consider the case of the middle initial. Some people have a middle initial and some don't. Of those that do, we may or may not know what it is. If I leave it Null, it says that I don't know whether they have one or not. However, I can set the field to "" (Empty string) which says that they DO NOT have a middle initial. Why is this difference important? Primary keys, for one thing. Let's assume that my primary key is a composite key composed of FirstName, MiddleInitial, LastName. A primary key CANNOT have a Null as a part of it, thus we can set the value of MiddleInitial to "", and it will accept it. But we cannot leave the value Null. Why can't a Primary Key have a Null value? Well aside from the fact that Access won't let it, the fact that Null means "I don't know the value" means that it cannot positively guarentee that the field is unique, which is one of the properties of the primary key. Running this sub will ALWAYS evaluate to False. Why? Because we don't know what the value of NULL is, so we can't say if it's equal to NULL. This evaluates to True because the IsNull() is specifically designed to test for NULL. This evaluates to True because the empty string is a known value. False because "" is known, therefore it cannot be unknown. As I said, NULL=NULL always evaluates to False. Since we don't know the value of Null, we can't say what it equals. This is why you never use NULL this way, but always use the IsNull() function. Further, Len(Null) does evaluates to Null, as indeed do most things you *compare* with or *do to* Null, ie. Null=Null, X=Null, Null=True, cint(Null), etc. Len("") ("" representing the 'Empty String' or 'Zero Length String') evaluates to 0 (zero). Because the length of a string of zero length is zero (duh!, my daughter would say). The problem with explaining NULL, is all the good words are used for something else. You can't define it with itself, so saying "Null is Null" is null content (forgive the expression). You can't use "nothing", because that is an object pointer used to de-allocate object variables. You can't use "empty", because that is a constant specifically for use with a Variant variable. You can't use Zero either, because that represents a specific numeric value, rather than the absence of a value. I guess we'll have to blame E.F. Codd who declared that any relational database implementation must have a special value called "Null" which represents the "absence of anything" or “unknown” condition for all datatypes. The best we can do is to say that the value of Null is 'we don't know', which is not to say that we don't know what Null is ... I'd better stop there.